HOW LONG DOES DRUG ADDICTION TREATMENT USUALLY TAKE ? Individuals progress through drug addiction treatment at different rates, so there is no predetermined length of treatment. However, research has shown unequivocally that good outcomes are contingent on adequate treatment length. Generally, for residential or out patient treatment, participation for less than 90 days is of limited effectiveness, and treatment lasting significantly longer is recommended for maintaining positive outcomes. Costs are All inclusive, with the “exception” of below. Detox is required prior to arrival. 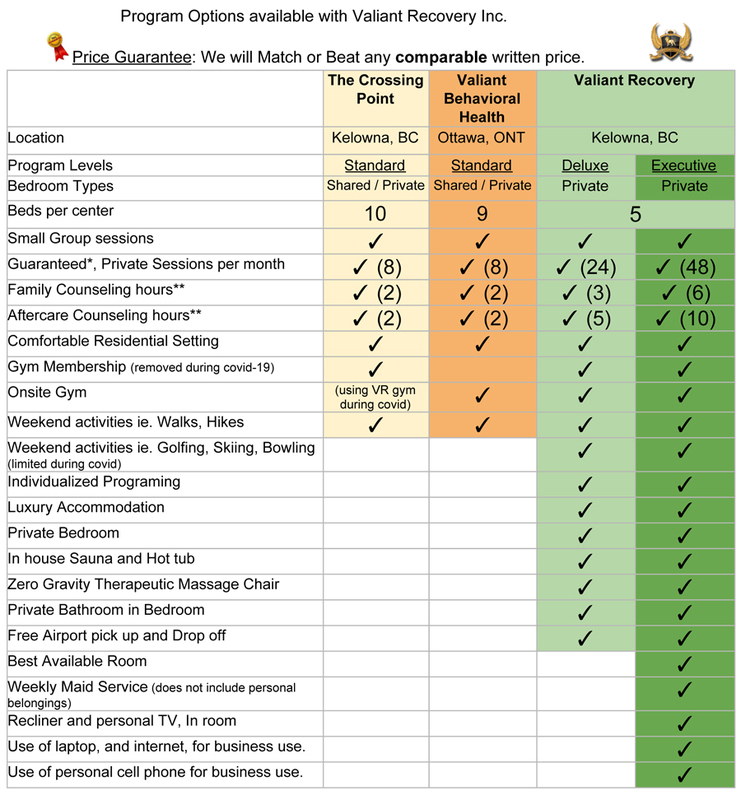 A detox facility is available in Kelowna to which we can refer you, prior to your arrival with us. Detox will last 7 days. The price of Detox ranges between $4000+tax. Your 30 day program at Valiant Recovery will begin after detox. Valiant Recovery offers 30, 42, 60 and 90 day programs. Price may vary dependent on individual needs, and will be determined during our intake assessment. Rooms are Private with double size beds, each room has a en-suite bathroom.